Otto Liman von Sanders was born on February 17, 1855 in Stolp in the Pomerania province of Germany. 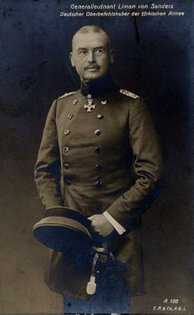 He began his military career in 1874 and served in numerous staff and divisional commands before being appointed the head of the German military mission to Turkey in 1913. His appointment resulted in protests from Britain, France and Russia and a compromise arrangement was subsequently agreed whereby von Sanders was appointed to the rather less senior position of Inspector General in January 1914. In the months prior to the outbreak of war in August 1914, von Sanders worked to improve the Turkish army's capabilities. He was uncomfortable in his dual role of diplomat and soldier and his influence upon Turkish affairs was notably diminished by his inclination to pursue German interests at every opportunity. As an example of his true interests, von Sanders attempted to persuade the Turkish government to pursue a military alliance with the Central Powers. In August 1914, von Sanders accepted the command of the Ottoman First Army, stationed in Istanbul. After Turkey entered the war, in March 1915, he was assigned to the command of the Fifth Army in Gallipoli. 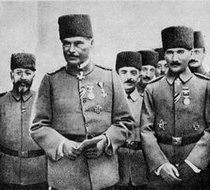 However, during the war, his influence in Turkey and particularly on Enver Pasha remained minimal. In February 1918, von Sanders undertook the command of a combined Turkish-German force on the Palestine front. After the armistice, he returned to Istanbul to oversee the repatriation of German troops. He was briefly arrested by the British on suspicion of war crimes in February 1919. He was released in August the same year and retired from the army. Otto Liman von Sanders died on August 22, 1929 in Munich.